I love any dessert that can be made into cupcake form. Everything is fancier as a cupcake right :)? 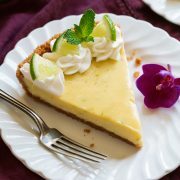 It’s been some time since I’ve been meaning to post a key lime pie recipe and since it’s now summer I realized it can’t wait any longer. It is one of the most refreshing chilled desserts and it has the tropics written all over it, especially with a coconut upgrade. If you aren’t a fan of coconut, you can leave it out (I don’t understand how anyone could not like coconut but there once was a time when I was little that I didn’t care for it), simply replace the 1/4 cup coconut in the crust mixture with 2 extra sheets of graham cracker and omit the coconut extract and extra coconut on top and you’ll have regular key lime pie. 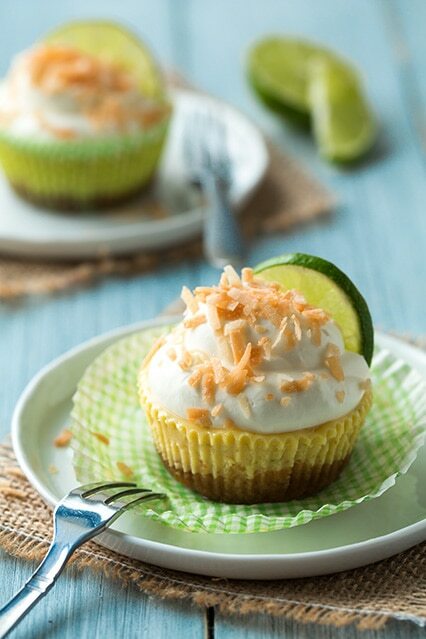 So I thought of labeling this recipe as Coconut Lime Pie Cupcakes because I really never use key limes, and I was happy to hear Cook’s Illustrated mention they didn’t taste a difference between the pies when using the regular limes vs key limes. That makes juicing and zesting a lot easier for me. Plus I only see key limes at the store every so often, and if I’m in the mood for key lime pie I don’t want to wait around for those key limes to show up. It wouldn’t be as familiar to people though it this were labeled as “Lime Pie” don’t you think? When it’s labeled as “Key Lime Pie” it just reminds us of our favorite key lime pie we’ve eaten. Of course you can use key limes if you’d prefer. To me it’s not quite worth the extra effort. I’ll take the large juicy limes and be done with my pie while your still squeezing those itty bitty things :). Which ever limes you choose just be sure to try this. You’ll be coming back for more of it’s velvety smooth, lusciously creamy texture and vibrantly tangy bite which is perfectly paired with it’s deliciously sweet and toasty coconut. Enjoy! 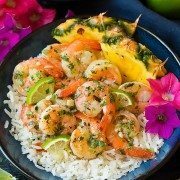 A cupcake with a taste of the tropics! 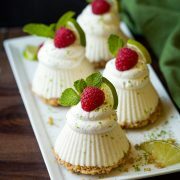 Mini key lime pies with a flavor upgrade of coconut. Preheat oven to 350 degrees. Spread coconut in an even layer on a rimmed baking sheet and toast in preheated oven 6 - 8 minutes until golden brown, stirring once halfway through baking. Remove from oven and transfer to a bowl. In a non-reactive mixing bowl whisk together lime zest and egg yolks for 2 minutes, until mixture is slightly tinted green, Stir in sweetened condensed milk. Pour in lime juice, vanilla and coconut extract (for more coconut flavor you can add an additional 1/4 tsp coconut extract) and mix until well blended. Allow mixture to rest 30 minutes, without stirring, at room temperature to allow to thicken. Meanwhile prepare graham cracker crust by placing graham crackers and 1/4 cup toasted coconut in a food processor and pulse until finely ground, about 30 - 40 seconds. Add in light-brown sugar and melted butter and pulse just until mixture is evenly coated. Divide mixture among 12 paper lined muffin cups, spooning about 1 heaping Tbsp mixture into each cup, and press mixture into an even layer. Bake in 350 degree oven for 5 minutes. Remove from oven and allow to cool. Reduce oven temperature to 325 degrees. Divide lime pie filling among 12 cups, pouring mixture over graham cracker crust layer and filling each cup nearly full (about 1/4 cup in each). Bake in preheated oven 14 - 16 minutes, or until cupcakes only jiggle slightly. Remove from oven and allow to cool to room temperature, about 45 minutes. Once cool cover loosely with plastic wrap and transfer to refrigerator and chill 3 hours (note, I chilled mine in the muffin pan but the butter from the crust made the cups stick to the bottoms of the pan once it was chilled - so I simply poured hot water into a cookie sheet then set the muffin pan over the warm water and removed them after about 20 seconds. You could probably lift them off of a plate easier though if you put them on a plate before refrigerating :). In a mixing bowl, using an electric hand mixer, whip heavy cream on high speed until soft peaks form. Add powdered sugar (if you want more coconut flavor you can add 1/4 tsp coconut extract to the whipped cream along with the sugar), whip until stiff peaks form. 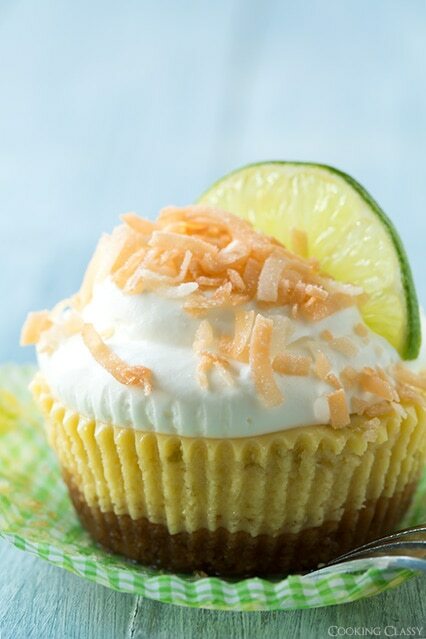 Just before serving, spoon or pipe whipped cream over cupcakes and sprinkle tops with remaining toasted coconut. Garnish with lime slices if desired.